To explore stars in the night sky and gain an understanding that scientists categorize them by various orders of magnitude, size, and distance. In this lesson, students use GoSkyWatch Planetarium, an interactive app for exploring the night sky that is available for iPad, iPhone, or iPod Touch. The app allows you to identify and locate stars, planets, constellations, and other astronomical objects by touching the screen or by pointing it to the sky. In this lesson, the app is specifically used as a tool to help students understand and apply the concepts of star apparent magnitude and luminosity. The lesson serves as a good introduction to the study of stars and astronomical objects. Some basic algebra is used to illustrate the mathematical relationship between luminosity, apparent magnitude, and distance. The lesson can then be followed up with an introduction to Hertzsprung-Russell diagrams, as well as a closer study of star chemistry and technology to observe stars. Conceptually, students may have difficulty understanding why lower magnitudes correspond to high apparent magnitude or brightness. This concept is actually logical when explained in the context of history: the brightest stars were of the first magnitude, the next brightest of the second, and the faintest stars were of the sixth magnitude (the limit of visual perception). The original system of magnitude from 1 through 6 has since expanded. It may help to discuss magnitudes with reference to their order. First magnitude stars are brighter than second magnitude stars, and very bright stars have negative magnitudes. For example, Sirius—the brightest star in the sky—has an apparent magnitude of -1.4. This lesson focuses on apparent magnitude, or how bright the star appears from Earth. The absolute magnitude of stars—how bright the object is at a distance of 10 parsecs—and how that is calculated, is not introduced in this lesson. The lesson begins by looking at the Little Dipper, partly to address the common misconception that Polaris (North Star) is the brightest star in the sky. This misconception is addressed in the Development section of the lesson. Another misconception that students may have is the Big Dipper and Little Dipper are constellations, rather than being subsets of larger constellations (i.e., asterisms). The lesson also will introduce students to the app itself, which can then be used by students in self-directed ways both in and out of school. If a mobile iPad lab is available, each student can use the app on his/her own for this lesson or in small groups. Students also can use the app on an iPhone. The app is free to download. Review the user’s guide for the GoSkyWatch Planetarium iPad app. Load the app onto your classroom's mobile devices. Ask students for the names of stars and constellations that they have heard of before. List them, making distinctions between stars and constellations (e.g., Vega vs. Orion). 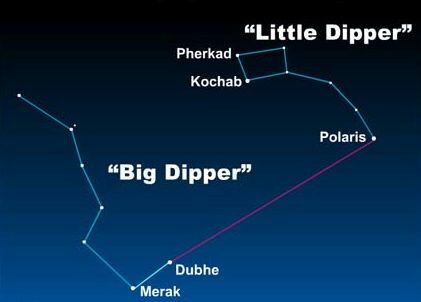 Many students may have heard of the Big and Little Dipper. Ask students what they know about the Little Dipper. What do we think this star chart is showing us? Besides the stars, what else is indicated in the star chart? Regardless of whether the star chart is found online, in the back of an astronomy magazine, or a book, star charts indicate direction, time, season, and relative sizes and distances of stars. Many also show other objects in space, such as planets and galaxies. Students should practice using the star charts. For example, ask them to orient their sky charts to reveal what the Northern Hemisphere winter night sky looks like when facing east at 10 p.m., north at 8 p.m., etc. Students should discuss the various factors that prevent us from seeing all the stars of the night sky indicated on the map, including light pollution, smog, clouds, the moon, etc. Returning to the Little Dipper, ask students: "What helped you find the Little Dipper on the star chart?" Discuss how patterns are the basis of constellations. If students have not said so already, indicate that the Little Dipper is actually part of a larger constellation known as Ursa Minor, or the Little Bear. Students may be interested in the mythology behind the naming of Ursa Minor; encourage them to research this mythology and share with the class. Also encourage students to look at Native American history of the stars, reminding students that different people and cultures across the planet all looked at the same stars and had different naming systems. Continue by asking students about the relative brightness of the stars in the Little Dipper. Emphasize the term “relative brightness,” ensuring that students know that you are not speaking about the actual brightness of a star. To help us recognize the patterns, we can tell that some stars are relatively brighter than other stars, and that this brightness is associated with the relative sizes of the stars to one another. In other words, on a star chart, the big dots indicate bright stars and the small dots indicate dim stars. On the board, draw the basic seven-star pattern of the Little Dipper. When we look at the Little Dipper, we expect to see this pattern of stars and that these specific stars (pointing to the appropriate ones) are relatively brighter than the other stars in that constellation. Project or provide students with an image of the Little Dipper. Ask students why some stars are brighter than others. Students may mention a number of different reasons including size, temperature, age, chemical make-up, distance from the Earth, etc. Students also may mention environmental factors for why stars may look brighter or dimmer, such as smog, clouds, and competing sources of lights (e.g., a full moon, city lights, etc.). Students should use their Star Light student esheet to visit The Universe Adventure and read the top section entitled Apparent Magnitude. They should use the information on this site to answer questions on the Star Light student sheet. After they have completed their work, go over the first five questions together, using the Star Light teacher sheet for reference. The big idea is that apparent magnitude is a measure of how bright we perceive a star is from Earth. Brighter stars are lower magnitudes while dimmer stars are higher magnitudes. The scale was initially developed by a Greek mathematician, Hipparchus, around 150 B.C.E. using six levels. The brightest star was of the first magnitude, the next brightest of the second magnitude, and so on. The faintest stars were of the sixth magnitude. The scale has since been expanded, both below zero and above six. Apparent magnitude is dependent on two things: luminosity and distance. Review that luminosity is a measure of the total amount of energy emitted by a star or any other astronomical object. Bring up an example of a light bulb that is 60 watts. No matter where we are in reference to that bulb, its luminosity is the same—60 joules/second, or watts. However, as we get farther away from that bulb, it will illuminate a surface less and less brightly. The farther we are, the less bright it will seem. What we perceive due to the distance is apparent magnitude. The closer we are, the brighter it seems and so it has a low number on the apparent magnitude scale. The farther we are, the less bright it seems; this gives it a higher apparent magnitude. Star luminosity is also measured in watts or joules/second. The luminosity of the star (Lsun) = 3.9 x 1026 W. Often, the luminosities of stars are measured in relation to the sun’s luminosity. For example, a certain star may have 4.8 times the luminosity of the sun (Lstar = 4.8 x Lsun) meaning that the star has 4.8 times the energy output per second of the sun. To help students understand the concept of light-years for distance, students should use the student esheet to go to How far is a light-year? on the EarthSky site. They should answer the questions on the student sheet. You can find answers on the teacher sheet. Review with students that the measure of distance that is used for stars and other astronomical objects in the sky is light-years. One light-year is the distance that light can travel in one year in a vacuum. Light travels at an incredible speed of about 300,000 kilometers or 186,000 miles per second! The closest star to the Earth is the sun, which is 150 million kilometers or 93 million miles away—one astronomical unit or au. The time it takes for light from the sun to travel to Earth is approximately 8 minutes. Tell students that the two fundamental measures of distance in astronomy are au's and light-years. The distances of planets and comets are usually measured in au, which gives us an idea of how far away things are with respect to our distance from the sun. The distance of stars is usually measured in light-years. For example, the closest stellar object to us after the sun is Alpha Centauri at 4.4 light-years. Students have now been introduced to apparent magnitude, luminosity, and distance of stars. Now use the Apparent Magnitude teacher sheet to help guide students through the use of the GoSkyWatch Planetarium app on the iPad or iPhone. Students should use their Apparent Magnitude student sheet to follow along and record information. A variety of different apps can be utilized to produce these short videos, including iMovie, Animation HD, Explain Everything, Show Me, Comic Life, or others. Encourage students to be creative and imaginative. Show students Stargazing Basics 2: Understanding Magnitudes, an example of a 5-minute educational video. A next step for students is to record the luminosity and magnitudes of various stars and then to plot them, creating their own Hertzsprung-Russell diagram of the stars they’ve identified. The apparent magnitude scale is also a good opportunity to discuss logarithmic scales. This is because the ratio of brightness (IA/IB) between different magnitude stars is constant at 2.512. Using the following formula, students can compare the brightness between any two astronomical objects by simply using the GoSkyWatch Planetarium to determine the two apparent magnitudes (mA and mB).